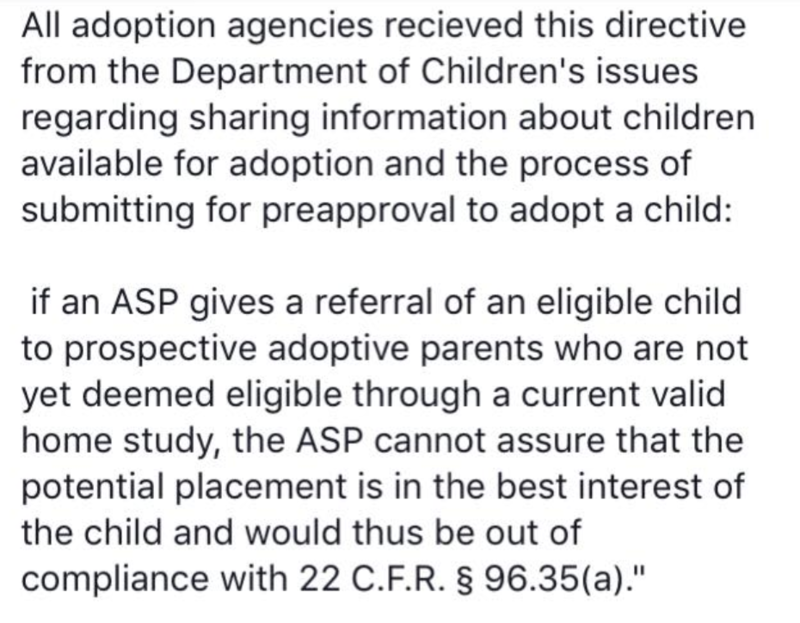 One big occurrence which I haven’t written much about yet is that the US entity overseeing intercountry adoption is changing from the Council on Accreditation to a newly formed organization called Intercountry Adoption Accreditation and Maintenance Entity (IAAME). The US State Department has posted FAQs about this change on their website. Until now, adoptive parents and adoption advocacy groups have focused on the new fee structure. The Save Adoptions group is warning that new fees will shut down intercountry adoption altogether while adoption ethics advocates sensibly point out that having a paid team of employees who travel to sending countries to inspect agency offices is going to cost more than four volunteers who who monitor from stateside. While the law referenced hasn’t changed, IAAME is apparently interpreting it differently than was the previous practice. This will have a significant impact on the China program, because China allows children with special focus designated files to be matched with families who have not even begun the home study process. This was allowed previously because there was technically no referral given until the LOA/LSC. The Letter Seeking Confirmation says, in effect, this is the child we have matched you with. Do you accept the referral?” All of the “matching” prior to that was more like “We have a family that is interested in this child. Could you hold the file and IF the family is qualified and IF you think they’d be a good match, THEN you could officially refer that specific child to this specific family?” Adoption agencies, China, and the potential family knew that it was a matter of being able to jump through hoops, but it wasn’t an official referral. A significant amount of families choose the China program because they can choose a child first. It is no exaggeration to say that hundreds of families had no thought at all of adopting until they saw their child’s face. The concern of agencies and adoption advocates is that many people will simply decide not to adopt at all if they don’t have the motivation of a specific child’s face. The Save Adoptions perspective is that anything which puts up a barrier to children being adopted is bad. The top priority is to get these kids home to families, which a laudable goal. However, the point of the Hague treaty and changes in regulations is to make sure adoptions are handled in an ethical manner. Lots of babies came home to families in the 80’s and 90’s that turned out to be children which were bought or stolen. We want to make sure that doesn’t happen again. We also need to preserve the rights of the children. One of those rights is the right to privacy. Many countries prohibit photolistings altogether. Here in the US, you will only find children whose parental rights have been terminated on photolistings, not children in foster care who are not yet available for adoption. One of the concerns about the partnership system in China is that agencies could pressure orphanage officials to prepare files for children who might be able to be placed domestically, or even to unethically obtain young children with minor needs to fulfill a quota. What we are talking about is a requirement that agencies make sure potential families are actually qualified to adopt before they start matching them with children. Is that really an extreme requirement to have? Before now most of the requirements have focused on the sending country side. However, the US has always been outside the norm in the way we do things. Other countries require families be approved to adopt and have a dossier sent before they are matched with a child. Of course, other countries also adopt only a handful of children a year compared to the US. There are some valid concerns when you “soft match” a child with a family who has not been home study approved. One of them is that you tie of the child from consideration of other families. Children have been soft matched to a family for months, sometimes close to two years in a few cases, only to have the family not complete the process in the end. Having a home study already completed shows a level of commitment. Another serious concern is that if a family is already soft matched to a child, the social worker is going to be under pressure to approve the family. Yes, most families will pass a home study. However, would the social worker have normally approved them for an older child or a child with serious medical needs if they hadn’t already been matched? It is not unusual for people to be motivated to adopt an aging out child when they had previously never considered adopting an older child. If a family is already matched, will they give real consideration to the challenges that adopting an older child will bring? Older children are at high risk of disruption or dissolution for this reason. When I pointed this out in an online discussion, someone said essentially that if we ruled out the people who decided to adopt an older child on the spur of the moment because of an advocacy post, no older child would be adopted. How many people start out by saying “I’d like to adopt a teenager”? Very few. And very few set out to adopt children with major medical needs. While no one is sure at this time how this will play out, I hope that we will all remember that both sides want vulnerable children to find families. We all want to make sure that the adoptions which take place are ethical adoptions leading to a secure family bond rather than disruption or dissolution. It is very difficult to balance setting regulations to ensure ethical adoptions while not completely eliminating practices which are effective at finding families for children. 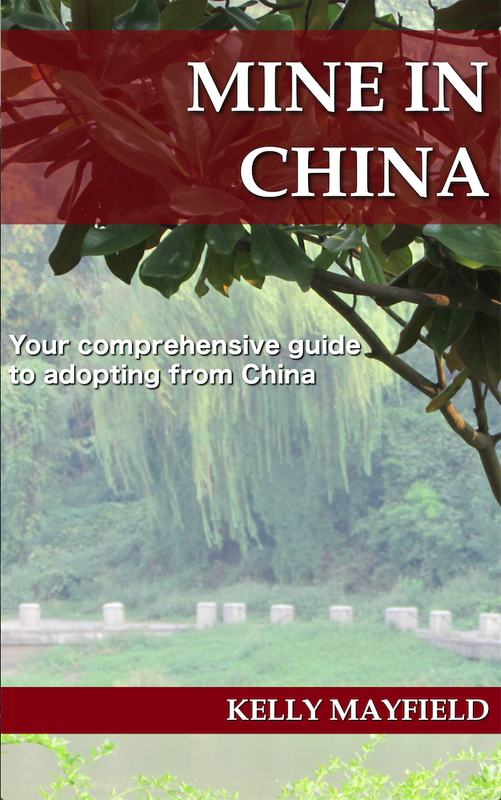 This entry was posted in Uncategorized and tagged Adoption Resources, China program updates, International Adoption on February 22, 2018 by minefam. The US State Department has announced the fee structure for the new entity of IAAME, which will replace the COA as adoption oversight entity. You can read the announcement, fee structure, and FAQ here. However, agencies are objecting to this fee structure is being likely to increase adoption costs for parents and possibly shutting down small adoption providers. They say that the above statement is written specifically to present the fee changes in the best possible light. The National Council For Adoption, along with many adoption providers, are asking concerned families to contact their member of Congress on February 7th and 8th to voice their opposition to it. You can read more about this here. I’m still seeing a lot of questions about the move to an all shared list China program. I have a general post here which explains the changes if you are unfamiliar with them. I cannot give any information as to changes in referral time because many agencies are still receiving partnership files at this time. It is possible that many LID files will still be designated to agencies for matching even after the partnership files have officially ceased. I know this change is causing a lot of uncertainty for people, but unfortunately we simply have through 2018 to see how these changes play out. The CCCWA’s change to not requiring an orphanage donation is still causing controversy and hard feelings among adoptive parents who have or are traveling recently. The CCCWA apparently released the notice without consulting or notifying the provinces. Many orphanages were completely caught off guard by donations ceasing because, very unfortunately, many families have taken the opportunity to donate little or nothing in order to save on adoption costs. Please families, take the time to read this post from Tammy Wombles, who works at an orphanage in China so is on the ground observing the changes, before you decide to skip the donation. Don’t forget to catch 28 Days of Hearts 2018, where you can read the story of a child who was adopted with CHD every day in the month of February. Echo Parenting & Education has a great concise summary of the impact on trauma which would be good to share with educators or family members. From A Musing Maralee blog, read My Kids Are Not Your Sales Pitch which discusses how adoptive parents should consider their child’s privacy when deciding how much personal information to share. The Lifeline blog has an article on the same topic here. The lunar new year will be here next week. The Living Out His Love blog has many great suggestions for celebrating including decorations, books, and recipes. ABC News has an article discussing how bestsellers”Blue Nights” and “Steve Jobs,” expose an unspoken truth in the adoption world: Fear of abandonment is universal. MLJ Adoptions has great post giving tips on how to help your child adjust to their fear of your family dog. For a pick me up, check out this video from The Archibald Project focusing on Bethel China. This entry was posted in Uncategorized and tagged Adoption Resources, What I'm reading on February 7, 2018 by minefam.